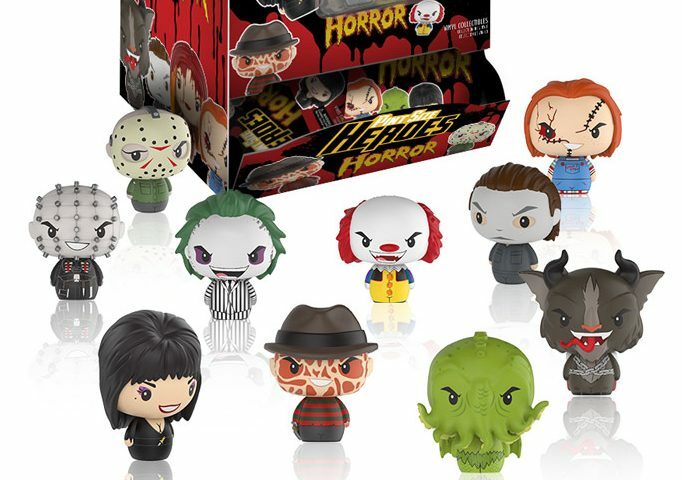 Funko has just announced a new line of their Pint Size Heroes collectibles featuring many of our favorite horror movie icons, including Michael Myers, Freddy Krueger, Jason Voorhees, Chucky, Pinhead, and many more. The complete collection of 12 new 1.5-inch blind bag figures includes Michael Myers from Halloween, Freddy Krueger from A Nightmare on Elm Street, Jason Voorhees from Friday the 13th, Chucky from Child’s Play, Pinhead from Hellraiser, Pennywise from Stephen King’s It, Stripe from Gremlins, the title characters of Carrie, Beetlejuice, and Krampus, as well as Cthulu and Elvira. A new Rocky Candy five-inch vinyl figure of Elvira was also announced today. Funko will release the first series of Horror Pint Size Heroes in August 2017. Check out the preview images below!